"'Poker plants' are also known as red hot pokers. One look at these flaming torches and you will see that name is fitting indeed." 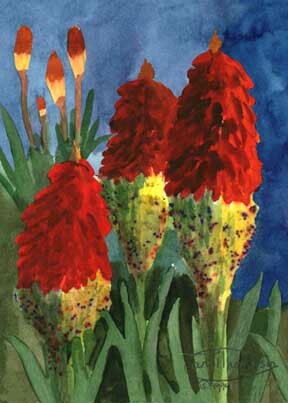 "Poker Plants" is a 7" X 5" original watercolor painting on Arches 140 lb. hot press paper. "Poker Plants" is a limited edition, giclée print from an original watercolor painting by Carol Thompson. The edition includes 3600 authorized, signed, limited edition prints (3500 numbered and 100 artist proofs). Release date is February 2000. Image size and substrates vary. All prints are signed and numbered by the artist and include a certificate of authenticity. Paper prints are shrink wrapped on foam board. Canvas prints are coated with a protective spray.